Technology takes us to new places everyday. It also takes us to old places everyday as well (like Facebook.com). But, it’s the new places that are more fun to talk about. For those of us that obsess about effects, amps and guitars, technology gives us the ability (or at least the hope) of hearing that tone we hear in our head. Technology is the piece that allows us to scratch that musical itch and to push out sound in the direction of desires. But, sometimes it just shows us really cool stuff. Such is the case with this story out of Tokyo. There’s a new video going around that gives and in-depth, slow motion look at the movement of guitar strings in motion. I’ve seen videos of the effects that sound waves (bass tones in particular) have on water. The odd angles and shapes the pouring water takes as it cascades down past the speaker. This experiment is in the same vein, with spectacular results. 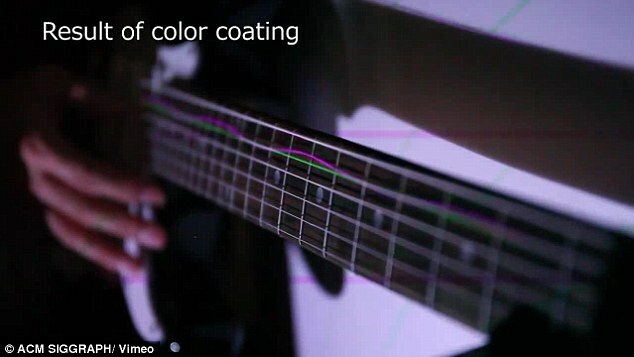 In this experiment by Shogo Fukushima and Takeshi Naemura from the University of Tokyo, each guitar string is slowed down to super-slow motion. What happens is you can seen each string vibrate and appear to oscillate with flashes of color. It’s a trippy awesome spectacle that’s worth taking a few minutes to view. The video is below. They call the action of the wobbly strings, “Rolling Shutter” and I can’t help but wonder what the physical representational waves of various guitar effects would be when viewed in the same light. What colors roll of the physical waves of distortion, reverb or overdrive? I know that builders often use osciilscopes to view the electrical pulse of signals over a period of time, which is sort of the same thing. Or is it? Lots to learn in the world of effects. Let us know what you know and we’ll pass it along.